William of Ockham (c. 1285-c. 1347) was the most eminent and influential theologian and philosopher of his day, a giant in the history of political thought. He was a Franciscan friar who came to believe that the Avignonese papacy of John XXII had set out to destroy the religious ideal on which the Franciscan order was based: the complete poverty of Christ and the apostles. 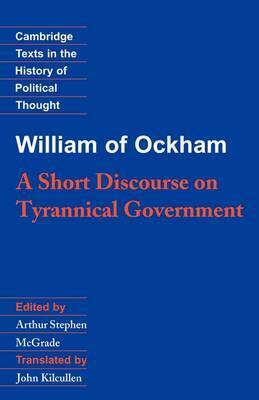 This is the first complete text by Ockham to be published in English. The Short Discourse is a passionate but compelling statement of Ockham's position on the most fundamental political problem of the medieval period: the relationship of supreme spiritual authority, as represented by the pope, to the autonomous secular authority claimed by the medieval empire and the emerging nation-states of Europe. Professor McGrade's introduction, and the notes on the translation make the volume wholly accessible to a modern readership, while a full bibliography and chronology are included as further aids to the reader.